Fluzone High-Dose is an inactivated influenza virus vaccine indicated for active immunization of persons 65 years of age and older against those virus subtypes A and type B contained within the vaccine. There have been no controlled clinical studies demonstrating a decrease in influenza incidence after vaccination with Fluzone High-Dose, when compared to standard dose flu vaccines. There are two flu vaccines called Fluzone: Fluzone and Fluzone High-Dose. Fluzone is billed using CPT 90658, whereas Fluzone High-Dose is billed using CPT 90662. Per the Food and Drug Administration’s approved labeling, Fluzone High-Dose is only covered by Medicare for beneficiaries age 65 or older. Medicare’s reimbursement is $11.37 for Fluzone, CPT 90658. Recently, CMS published that $29.21 as the current fee schedule for Fluzone High-Dose, CPT 90662. Please remember that reimbursement for both vaccines may change when CMS issues the average sales price (ASP) drug pricing updates on October 1, 2010. CMS is also reminding physicians that except for the H1N1 flu vaccine, Medicare normally covers only one administration of any influenza vaccine per flu season (July 1, 2010–March 31, 2011). HCPCS Q2039 Flu Vaccine Adult - Not Otherwise Classified payment allowance is to be determined by the local claims processing contractor with effective dates of 8/1/2017-7/31/2018. The Medicare Part B payment allowance limits for seasonal influenza and pneumococcal vaccines are 95% of the Average Wholesale Price (AWP) as reflected in the published compendia except where the vaccine is furnished in a hospital outpatient department. When the vaccine is furnished in the hospital outpatient department, payment for the vaccine is based on reasonable cost. Annual Part B deductible and coinsurance amounts do not apply for the influenza virus and the pneumococcal vaccinations. 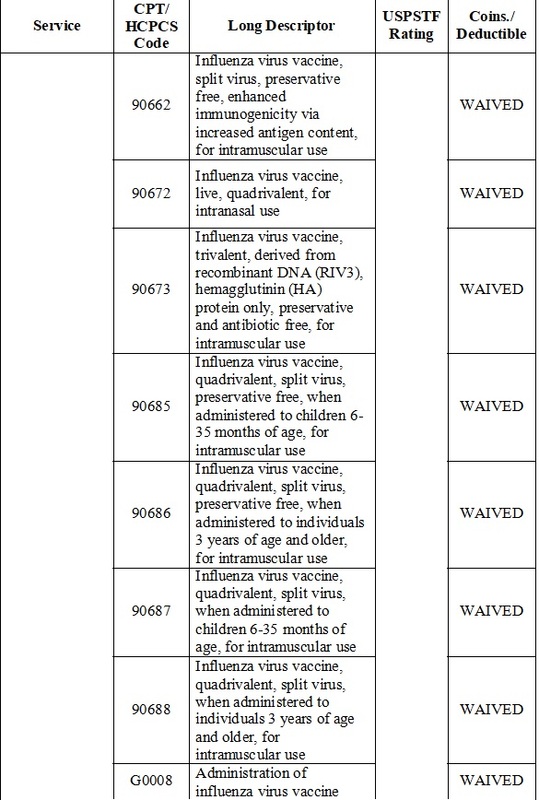 All physicians, non-physician practitioners, and suppliers who administer these vaccinations must take assignment on the claim for the vaccine. 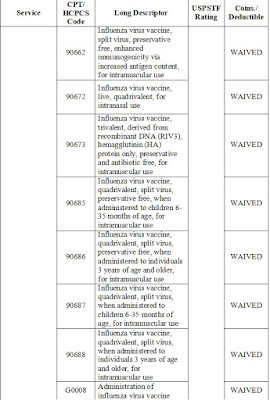 In 2012, to better conform to the Center for Disease Control and Prevention’s (CDC) recommendations for the prevention and control of influenza, CMS changed the payment limit effective date from September 1 to August 1. Recent CDC recommendations state that vaccination efforts should begin as soon as the seasonal influenza vaccine is available and continue through the influenza season.